Cecily Neville, mother of kings Edward IV and Richard III, is one character that will be hard to forget. I am fond of headstrong women who bucked the conventions of their day and in this instance, Cecily did not disappoint. I have studied history and read books on English history, but seldom do we learn of seemingly minor persons as Cecily. I am glad that Ms. Smith decided to write a novel with Cecily as its central character because the woman she portrays is truly fascinating. We learn of Cecily and Richard, Duke of York, and their long betrothal and subsequent marriage and it is portrayed that they were very much in love and that Richard welcomed his wife's veracity, although he had to warn her often to be careful about which subjects she would speak her mind. Cecily has a strong sense of justice and this was played out nicely with the edition of Jeanne d'Arc (Joan of Arc) into the story. It is not historically documented that the two of them met, but from reading interviews with Ms. Smith, I know that they were both at Rouen at the same time. I think it was a brilliant addition to the story and while some might think that Cecily was overly obsessed with Jeanne, I know that Cecily was depicted as being religious and speaks to the Lord and the Virgin Mary frequently throughout the book so it does not surprise me that Cecily would feel a connection with Jeanne. I'm ashamed to admit that I do not know very much about the War of the Roses, but this book gives an excellent depiction of how it all started. As Cecily's husband, Richard of York, has rights to the throne, he is regarded suspiciously by many and eventually raises the ire of Margaret of Anjou, wife to Henry VI. Cecily remains a staunch supporter of her husband throughout. She cuts a proud figure beside the vindictive Margaret. A new to me historical fiction author, Anne Easter Smith has written an outstanding novel. She introduces a historical figure who has not been historically explored in depth and it leaves me wanting more. I look forward to the next figure Ms. Smith takes her pen up to write about. • In Cecily Neville, duchess of York and ancestor of every English monarch to the present day, she has found her most engrossing character yet.History remembers Cecily of York standing on the steps of the Market Cross at Ludlow, facing an attacking army while holding the hands of her two young sons. Queen by Right reveals how she came to step into her destiny, beginning with her marriage to Richard, duke of York, whom she meets when she is nine and he is thirteen. Raised together in her father’s household, they become a true love match and together face personal tragedies, pivotal events of history, and deadly political intrigue. All of England knows that Richard has a clear claim to the throne, and when King Henry VI becomes unfit to rule, Cecily must put aside her hopes and fears and help her husband decide what is right for their family and their country. 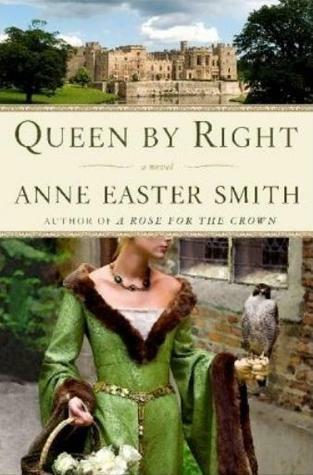 Queen by Right marks Anne Easter Smith’s greatest achievement, a book that every fan of sweeping, exquisitely detailed historical fiction will devour. Book was provided to me in conjunction with a book tour with the above. The opinion is mine and I was not monetarily compensated for giving it.